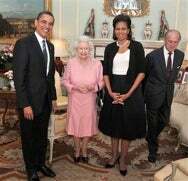 It’s April Fool’s Day, and we certainly couldn’t blame you if you chose to disregard this story, but we have it from no less than the New York Times that Barack Obama, in his maiden overseas voyage as head of state, has given the Queen of England an iPod. And not just any iPod, no siree. It’s an iPod loaded with pictures and video of Her Majesty’s 2007 visit to Virginia, where she went to historical sites such as Jamestown and Williamsburg, as well as the state capital of Richmond (seriously, though, would it kill her to get out of the thirteen colonies?). We don’t know precisely what kind of iPod the President gave her—we hope he sprung for a touch (laser-engraved, naturally); I’m sure the Queen has just been itching to get at the App Store. The Queen, by most reports, was currently rocking a circa 2005 6GB silver iPod mini, so I’m sure she’ll be glad for the upgrade. In addition, Obama gave her a rare songbook signed by Richard Rodgers; the Queen, in return, gave him a signed, silver-framed photograph of her and the Duke of Edinburgh, the same gift she reputedly gives all her other important visitors—we hear that Russian Prime Minister Vladmir Putin does the exact same thing. Update: Jake Tapper over at ABC News has the complete list of music loaded on the Queen's iPod, which appear to be pretty much be all songs from musicals.